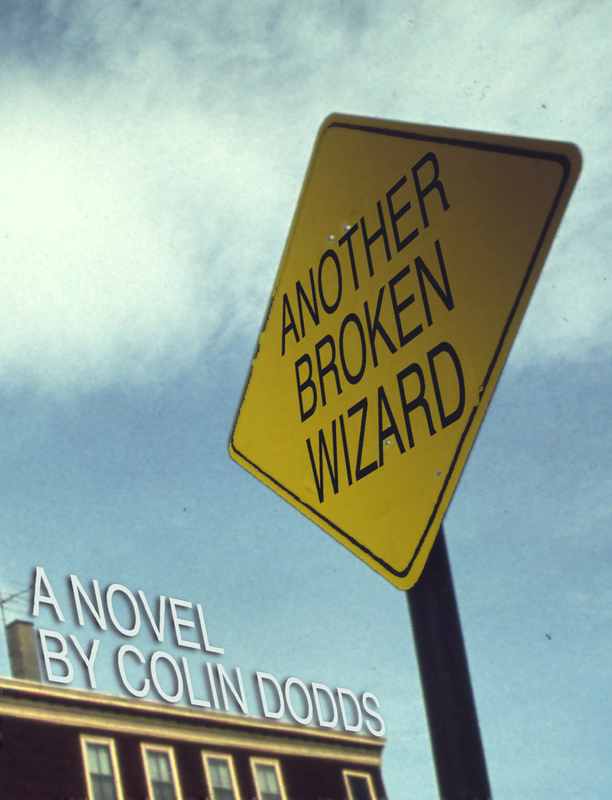 Here is the cover of Another Broken Wizard. Many thanks to the multi-talented Brendan Lorber, who conceived and created it. This is a review of Another Broken Wizard that appeared in Worcester’s Pulse Magazine. I’d like to thank Pulse’s editorial staff once again for taking the time and effort to read, and to write so glowingly about an unpublished novel. He comes home to shattered pieces ~ his father is about to undergo surgery, his mother is living a life of bitterness, never remembering the way love felt or the things it created. He has no job that he needs to hurry back to ~ he’s been laid off and the economy is horrid. He has returned to the streets, the billboards, the houses, the scents, the pull of Worcester, MA. He is Jim, and Colin Dodds, a Brooklyn, NY author, has chosen to tell his tale. Colin Dodds, 32, originally a Worcester boy and graduate of Shrewsbury’s St. John’s High School, is the scribe sitting at the desk , chasing the dark away with the simple yellow from the oil lamp light, writing this novel, Another Broken Wizard, and bringing us into the life of Jim. After being let go from a financial job in NYC, Jim comes home to a Worcester that he remembers, but is also just getting to know. There’s Joe ~ a childhood best friend who is joined to him by the silver cord that binds best friends, no matter what the circumstances or the choices. Joe, with his never-ending smile and sense of humor, may stoop to actions like selling cocaine to make a quick buck, but Jim will never leave his side. Then there are the women who come in and out of Jim’s life: Serena, the girl he left behind in New York to care for his ailing father, Emily, a school friend who is like a rock in stormy seas for Jim, and Olive, the girl he meets in the hospital when his father is unconscious who is the only one who can share in the pain and the helplessness of having a parent in that condition. Together, these ladies make a production of complicated relationships that make the reader turn the pages as quickly as possible, wondering what the next turn may be, wondering who might be the first to fall through the cracks in the sidewalk. Dodds gets Worcester and shows it in all of its glories and cracks through Jim’s character, as well as through the unsung hero’s character ~ Joe. Dodds, in a literary sense, runs through the streets of the city and nearby towns and takes the reader with him. He spares us no pain, he spares us no worry or the rapid heart beat of anticipation as he conveys the story of Jim, falling in and out of love and lust, getting too close to criminal circumstances, feeling the intense loyalty to a friend that is only brewed in the fiery and fanciful pots of childhood. The reader rushes on with Jim, through crowded bars, through drunken binges, through insufferable moments as he watches his father come close to death and watches his mother live a closed life that symbolizes the nails on her coffin. Dodds is a master of writing the town life and capturing all of the said and unsaid. His characters are so full of waiting, of pain, and of hope that never reaches past the next day. Jim Monaghan really didn’t want to go back to Worcester. But his father’s open-heart surgery and Jim’s sudden unemployment forced his hand. Making daily trips from the hospital to his father’s empty apartment, Jim seeks out his childhood best friend, Joe Rousseau. But Joe has problems—a feud with a local gang. And Joe’s plan to resolve the matter only makes things worse. Tending to his father and embarking on an ICU romance in the day, Jim tries to help his friend. He follows Joe into Worcester nights defined by drugs, guns and fistfights. As the danger escalates, Jim makes a painful choice to save his friend, and then has to live with the consequences. Another Broken Wizard is a book about straddling childhood and adulthood, straddling a fading industrial home town and the information-economy of our attenuated aspirations, straddling the love for a friend and self preservation. It is an evocative portrait of Worcester, Massachusetts—both its place in the 21st century and its past.